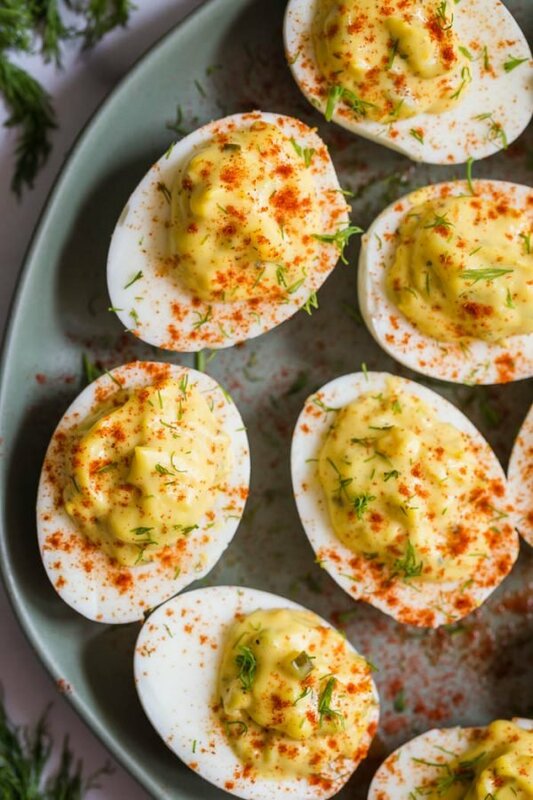 This Southern Deviled Eggs recipe with relish is an all time favorite and perfect for family get togethers and holiday parties! 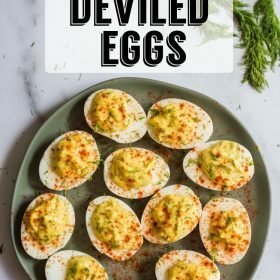 If there’s one thing that the internet does NOT need, it’s another deviled eggs recipe. I KNOW, trust me. 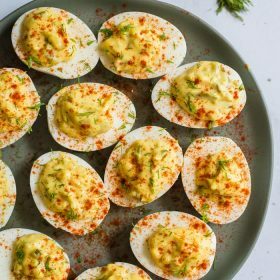 But I grew up eating deviled eggs on a very regular basis and so I wanted to share my own Southern Deviled Eggs version of this recipe. So, we’re doing this despite my inner voice advising me against it. 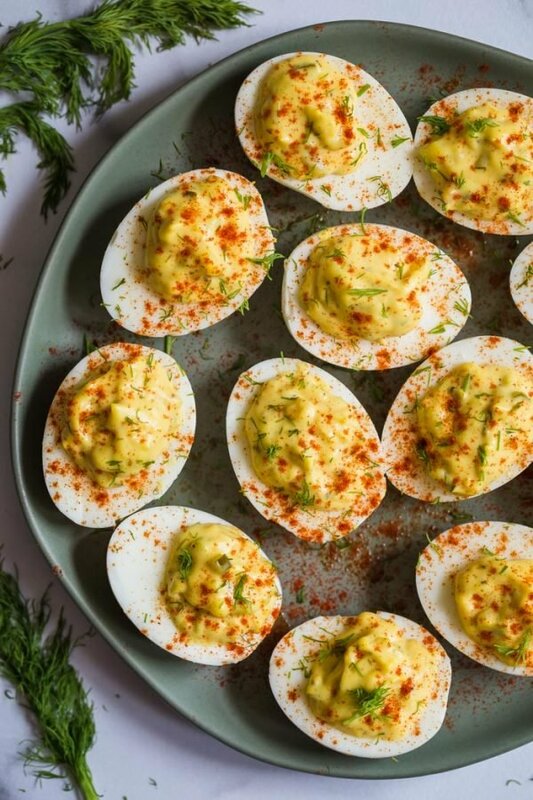 It’s deviled egg season so you should probably just ignore all of those other recipes and whip up a batch of these…Southern style. 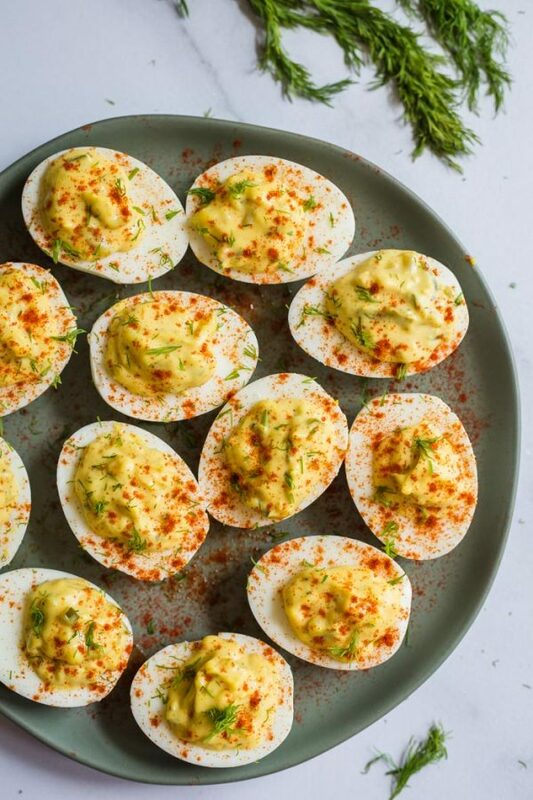 You might be wondering “Brita, what makes Southern Deviled Eggs different than regular ones”. Very good question! Relish. 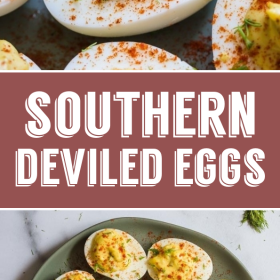 After a bit of research, I discovered that a deviled egg recipe with relish is something that you see much more often in Southern cooking. And, it’s the way that I grew up eating them. 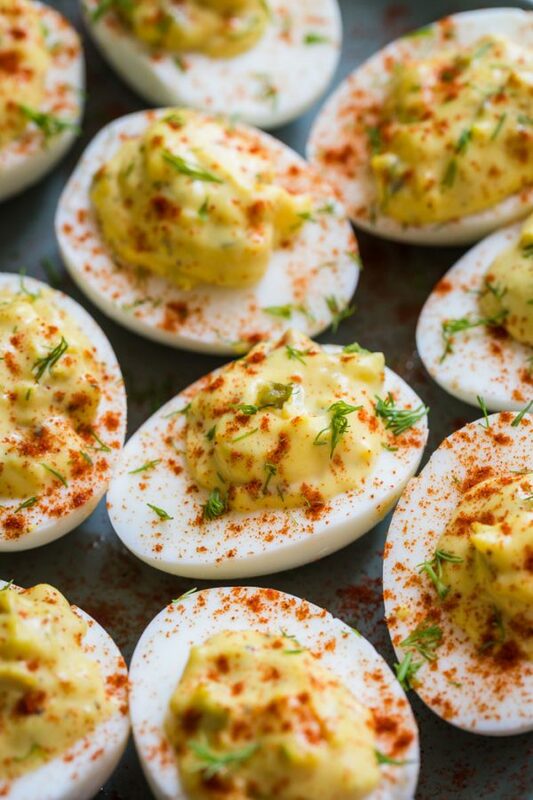 I love the tangy, salty flavor that relish adds to deviled eggs and it’s by far my preferred way of making them! I’ve learned over the years that every. single. person. has a different opinion on the best way to hard boil eggs and I’ve discovered that most of them work great. So, it’s really just a personal preference. While I often make my hard boiled eggs in the instant pot, my preferred method is the simple stove top method which I outline below in the recipe card. 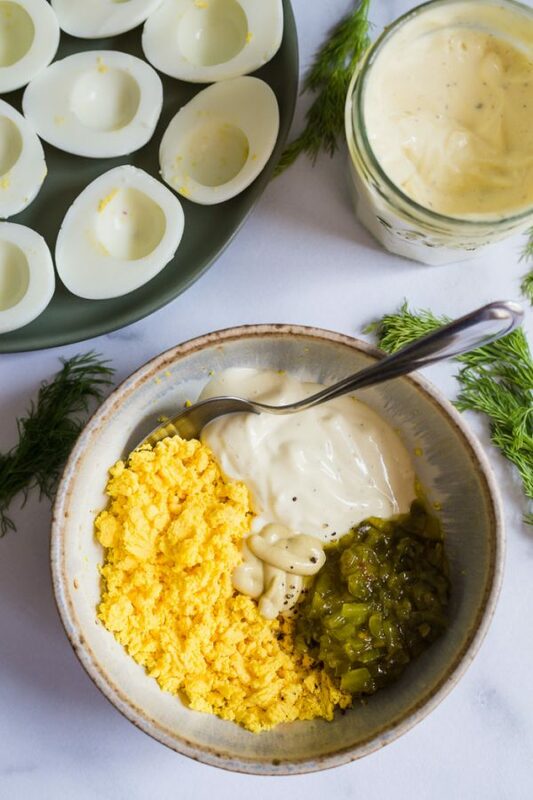 Instant Pot Hard Boiled Eggs: You can make them in the Instant Pot using THIS RECIPE from my good friend at Green Healthy cooking. She tested out a ton of different cook times and methods in the Instant pot to get perfect eggs for you. Hard Boiled Eggs in the oven: Lee from Fit Foodie Finds recently posted a clever way to hard boil eggs in the oven. You can learn how to do that HERE. I tried it out and they turned out great but do note that the outside of the egg can burn ever so slightly and leaves small dark spots on the eggs. They’re on the under side so it’s not something you would even notice when the eggs are laying on a plate and they still taste PERFECT! Stove-top Hard Boiled Eggs: while I like making them in the instant pot, more often than not I find myself using this classic method. I put my eggs in a pot with water and set it over medium-high heat. The water comes to a boil and then the pot is covered and removed from the heat. That is left to sit for about 10 minutes before the eggs are then put in an ice bath. The hardest part of this recipe is hard boiling the eggs. And, we’ve gone over that part already so all that is left is to simply make the filling! Once your eggs have cooled, carefully cut them in half and remove the yolks. Mash the yolks until they’re creamy and very few lumps remaining. Mix in the remaining ingredients. Once fully combined, simply add the filling back into the cavities of the eggs and ENJOY! If you want to be all fancy about, you can put the filling into a plastic bag and pipe it into the egg whites. I’ve done this a few times and while it looks very pretty, it’s an extra step that I most often just do NOT have time for. Additionally, this particular recipe results in a slightly more moist filling that doesn’t hold form very well if you’re wanting a peaked look to the filling. Hard boil your eggs. You can do this in the Instant Pot, in the oven, or using the classic stovetop method. To cook the eggs on the stove top, put the eggs in a pot and cover them with water so that there’s about an inch of water above the eggs. I’ve found that a teaspoon of salt in the water helps the eggs to peel quicker. Set the pot over medium hight heat and bring to a rolling boil. Once at a boil, remove from the heat, cover, and let sit for 10 minutes. Remove the eggs from the pot and place them in an ice bath to cool completely. Peel your cooled eggs and slice them in half lengthwise. Gently remove the yolks and place in a medium bowl. Mash the yolks until they’re creamy and very few lumps remain. Add the dijon, relish, mayo, and pepper to the yolks and mix well to combine. Spoon the mixture into the egg whites and sprinkle with a bit of paprika. Serve and ENJOY! *There’s enough salt in the mustard, mayo, and salt that you shouldn’t need to add any extra but adjust to your preferences.